Micheal Phelps diet has been revealed and I feel sick. 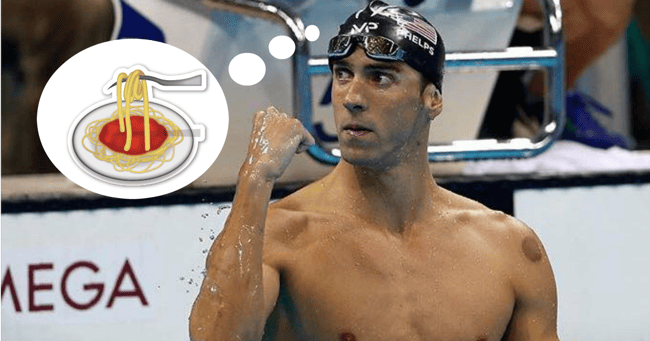 Michael Phelps shares what he eats in a day. Your stomach will hurt just thinking about it. He is the greatest swimmer we have ever seen, arguably the greatest athlete that has walked our planet and now Michael Phelps might as well take the cake (pun intended) for the being able to eat more food than humanly possible in a single day. The Olympic champion has revealed how much food he can traditionally eat in a day and if my stomach was rumbling 10 minutes ago, it’s cramping right now just consuming this information. During training times, which we can assume is almost year-round, Phelps consumes more than 12,000 calories a day. To give you a gauge of how much that actually is, according to the UK’s NHS the average male adult needs approximately 2,500 calories per day to keep his weight constant, while the average adult female needs 2,000. Usually eat an omelette for breakfast? No worries, he does too. What about some French toast? Add that to the menu. Also put in three fried egg sandwiches, three chocolate chip pancakes and a bowl of grits on your plate too. And then, my friends, you’ll have Phelps’ breakfast. But just wait until you hit lunch. If you’re thinking of adopting this kind of carb-fuelled diet, make sure you’re also swimming the additional 80km a week to keep it off. Otherwise, we all might find ourselves in a liiiiiiiiittle bit of strife.